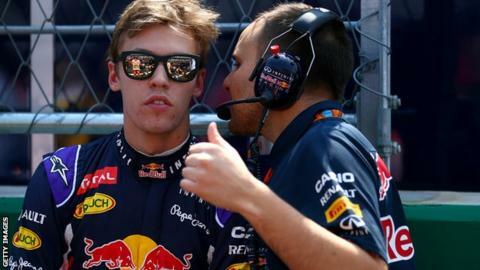 Red Bull say they will retain their driver line-up of Daniel Ricciardo and Daniil Kvyat next season - as long as the team is on the grid. Ricciardo has a contract until the end of 2018 but there have been doubts about the future of Kvyat after an up-and-down first season with the team. Team principal Christian Horner said: "Ricciardo's contract is fixed and all the options are on our side with Kvyat. "He's doing great. So long as we're here, he'll be in the car next year." Horner's comments seem to end speculation that Toro Rosso's Max Verstappen might be promoted to the senior team after an impressive debut season for the 18-year-old Dutchman. Red Bull's participation is still in doubt because they have not yet confirmed whether they have an engine for 2016. The team were last month close to concluding negotiations to terminate their contract with Renault a year early due to growing tensions between the two. But those talks stopped when it became clear Mercedes would not supply Red Bull and Ferrari said they could not supply them their 2016 engine next season. Insiders say that Red Bull are now likely to continue with Renault but with the engine given a different name so it does not appear to casual audience as if the relationship has continued. Renault are on the verge of taking control of the Lotus team and returning as a team owner and constructor. However, Horner suggested there was still another possibility for Red Bull: "There may be something else. We'll see." Red Bull have had talks with Honda about a supply, but works partner McLaren's chairman Ron Dennis has exercised his contractual veto to block the Japanese company supplying them. Toro Rosso are expected to use 2015 Ferrari engines next season.